MINIMUM REQUIRED INVESTMENT RATE of RETURN on next after tax dollar invested is between 2% and 9.6% adjusted for Inflation- just to maintain your Standard of Living in the future. State tax burdens add a varying extra burden, leaving you with less after -tax dollars to invest. Simply put: your investment return -at a minimum - must be greater than this Minimum rate before you can judge yourself to be better off. 1. Find your State in first column. 2. Find your Inflation estimate in Row 5.
down the rows for your State to find your own MRRR. Example: You live in New York State and are in the maximum Federal tax bracket. If you believe official inflation numbers then your MIRR is 2.87%. If you want to use the Average Inflation rate above, your MIRR rises to 8.32%. closer to the high number, then your MIRR is 13.77%. Ala. 4.00% 38 4.33% 8.33% 8 Ala.
Ariz. 6.60% 9 2.52% 9.12% 2 Ariz.
Ark. 6.00% 16 2.58% 8.58% 6 Ark. Colo. 2.90% 45 4.54% 7.44% 15 Colo.
Conn. 6.35% 11 None 6.35% 31 Conn.
Del. None 46 None 0.00% 47 Del. Fla. 6.00% 16 0.62% 6.62% 29 Fla.
Ga. 4.00% 38 2.84% 6.84% 24 Ga.
Ill. 6.25% 13 1.95% 8.20% 10 Ill.
Ind. 7.00% 2 None 7.00% 20 Ind. Kans. 6.30% 12 1.96% 8.26% 9 Kans. Ky. 6.00% 16 None 6.00% 36 Ky.
La. 4.00% 38 4.85% 8.85% 3 La. Md. 6.00% 16 None 6.00% 36 Md. Mass. 6.25% 13 None 6.25% 33 Mass. Mich. 6.00% 16 None 6.00% 36 Mich.
Minn. 6.875% 7 0.30% 7.18% 17 Minn.
Miss. 7.00% 2 0.004% 7.00% 19 Miss. Mo. 4.225% 37 3.26% 7.49% 14 Mo. Nebr. 5.50% 28 1.27% 6.77% 26 Nebr. Nev. 6.85% 8 1.08% 7.93% 13 Nev.
N.H. None 46 None 0.00% 47 N.H.
N.Y. 4.00% 38 4.48% 8.48% 7 N.Y.
N.C. 4.75% 35 2.10% 6.85% 23 N.C.
N.D. 5.00% 31 1.39% 6.39% 30 N.D.
Okla. 4.50% 36 4.16% 8.66% 5 Okla.
Ore. None 46 None 0.00% 47 Ore.
Pa. 6.00% 16 0.34% 6.34% 32 Pa.
R.I. 7.00% 2 None 7.00% 20 R.I.
S.C. 6.00% 16 1.13% 7.13% 18 S.C.
S.D. 4.00% 38 1.39% 5.39% 41 S.D. Tenn. 7.00% 2 2.45% 9.45% 1 Tenn.
Tex. 6.25% 13 1.89% 8.14% 11 Tex. Vt. 6.00% 16 0.14% 6.14% 34 Vt.
Wash. 6.50% 10 2.30% 8.80% 4 Wash.
W.Va. 6.00% 16 None 6.00% 36 W.Va.
Wis. 5.00% 31 0.43% 5.43% 40 Wis.
Wyo. 4.00% 38 1.34% 5.34% 42 Wyo. D.C. 6.00% (16) - 6.00% (36) D.C. Note: Some states levy gross receipts taxes in addition to sales taxes. See Table 20 for information on gross receipts taxes. (c) The sales taxes in Hawaii, New Mexico and South Dakota have broad bases that include many services, so their rates are not strictly comparable to other states. MINIMUM % REQUIRED RATES OF RETURN To BREAK EVEN after inflation. Below are two sources of more realistic data than the Dept of Labor inflation measures. The first, the Billion Price project from MIT and the second from John Williams's Shadow Goverment Statistics site.
" The CPI-U (Consumer Price Index for All Urban Consumers) is the monthly headline inflation number (seasonally adjusted) and is the broadest in its coverage, representing the buying patterns of all urban consumers. Its standard measure is not seasonally adjusted, and it never is revised on that basis except for outright errors" for July 2011 this number is 3.63%. "THE SGS Alternative CPI-U measures are attempts at adjusting reported CPI-U inflation for the impact of methodological change of recent decades designed to move the concept of the CPI away from being a measure of the cost of living needed to maintain a constant standard of living. For every one of us the lesson is that we must increase our income or the minimum rate of return on our invested dollars must be increasing at least at this minimum inflation rate to maintain the same standard of living we enjoy now. That would be a reasonably attainable goal were it not for Government at all levels making it more difficult with a vast array of taxes, levies and fees of all sorts. This minimum rate must be adjusted for the effect of Government dipping into your wallet before you get to use what is left over. Please go to the MRRR tab to calculate your personal Minimum required rate of return to maintain your standard of living. The MIT's billion price project which, as the name implies, tracks the prices of a billion products in real time. 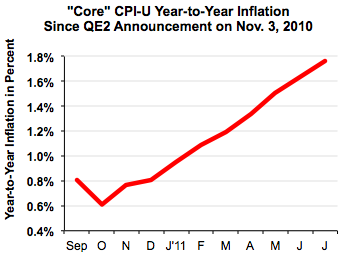 And according to the latter, annual inflation has hit a multi year high of about 4%.